Every couple of months, two people from Rotterdam Collectief cook dinner and two people show their work. This time, Robert Schols presented his poetry, Silvia Testa her drawings. Erika Hirose and Charlotte van Oostrum made dinner and dessert. Before tonight, almost nobody at Rotterdam Collectief knew that Robert wrote poetry. During the day, Robert runs Lusis ICT. At night, however, Robert writes novels and poems. For this evening, Robert and Silvia Testa, designer and illustrator, worked on a project together. Robert wrote a poem that was illustrated by Silvia. What could have caused such poverty? 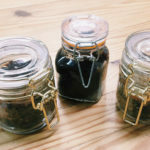 Erika, who makes her own miso and other fermented Japanese foods at WAKEAT., prepared a selection of fermented meats, Japanese croquettes and salads with miso-dressing. To offset the meaty main course (most food at RoCo is usually vegetarian), Charlotte served a vegan miso-banana cream pie.